Like the elements of the periodic table, the HumanGrid makes what was once invisible now visible. Confuting the pessimists, Robert Rosenfeld developed and patented the Innovation Strengths Preference Indicator™ (ISPI); a premier instrument designed to measure and identify the hidden human elements that influence our innovation and problem solving preferences. Along the journey of developing the ISPI™ were many other helpful instruments and assessment tools that measure and categorize personalities and preferences. Most of these tools provide an accurate snapshot of visible traits and types. The ISPI™ is the leading tool that actually identifies individual human elements that drive behavior and creates a “roadmap” of invisible forces. HumanGrid is a service that provides a platform of tools dedicated to the better understanding of the hidden human elements that influence our daily behavior. HumanGrid is the world’s premier platform that distills over 25 years of experience into an easy to use online tool chest and dashboard. 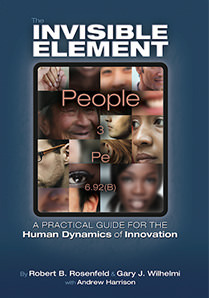 The HumanGrid platform of tools was developed, and designed by world class leadership coaches, award winning workshops and based on the bestselling books: “The Invisible Element” and “Making the Invisible Visible” by Robert Rosenfeld. HumanGrid connects at the human level with Organizations, Strategic Partners, Certified Practitioners, Individual Consultants, Therapists, Educators, Students, Families and couples. HumanGrid strives to provide an outstanding platform of tools for individuals and organizations. Our instruments and strategies are based on research and sciences aimed at uncovering the differences in each other and teach how to leverage those differences. With a premier arsenal of tools we all can benefit from the power of understanding the invisible human elements we all share. Continually uncover the invisible human elements in us all, in order to help break down barriers of ignorance, inequality, and prejudices; and in turn promote tolerance, creativity, innovation and harmony, to instill a vibrant appreciation for our unique differences and help humankind achieve World Peace. Click here to learn about how HumanGrid was born.